Watching the skies . 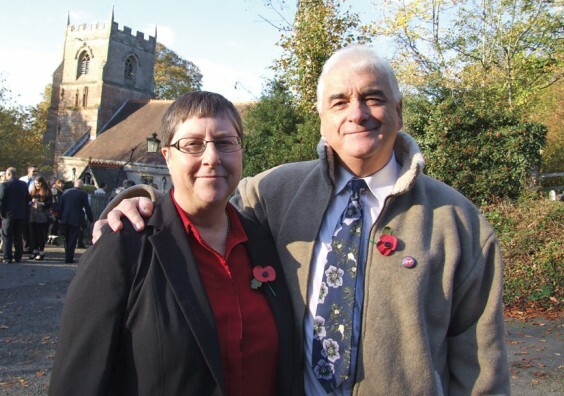 . .
An Alvechurch couple who are aiming to record the history of British UFO sightings since 1940 have now published a seventh volume of their Haunted Skies series. Retired police officer John Hanson and his partner Dawn Holloway, whom we originally featured in summer 2011, have no shortage of material to work with – their archive is probably the largest collection of information on UFO sightings in the country. “This latest volume covers the events which took place between 1978 and 1979, and shows through its astonishing number of pages (420 in total) that activity was rife in and around the skies of the UK,” says John. Since we last spoke to John and Dawn, they have also documented many hundreds if not thousands of sighting reports in Volumes 3 (1966-1967), 4 (1968-1971) and 5 (1972-1974), and a special Jubilee Volume 6 (1975-1977), a copy of which was dedicated to the Queen and sent to Buckingham Palace. They are hoping to get Volume 7 on to Kindle in the near future. “We are currently working on Volume 8 which covers 1980. This will include a scrapbook section and also a full colour update on other cases brought to our attention. John believes that UFO sightings go back many thousands of years, but Haunted Skies concentrates on documented reports from the 1940s onwards. Stories from the Second World War include that of Hans, a German soldier who was serving on the Russian front in 1944 and was one of thousands of German and Russian troops who saw a silver cigar-shaped object appear in the sky. This matter was reported to Berlin and presumably to Adolf Hitler himself. Another strange report found in Volume 1 came from British Serviceman Lesley Grant, who was driving a captured German tank at Arnhem in 1944 when he was warned by an officer not to go any further. However, curiosity got the better of him and he went to look, finding a landed grey saucer-shaped object. When he tried to approach it he found himself being stopped by what felt like an invisible cushion. John adds, “We came across a similar story involving milkman John Payne, who was having a break at Winkleigh Airfield in Devon when he saw what looked like a submarine-shaped object with fins lying on the runway. “He too was prevented from getting any closer by what he described as an invisible cushion, which you could actually lean on. “And he wasn’t the only one – a journalist from a Reading newspaper tried to get close to a landed UFO during 1967. “Unfortunately this was around the time when a number of bleeping ‘flying saucers’ were discovered at various locations around the UK, and when the police opened them they found they had been filled with fertiliser and were part of a students’ rag day prank! Those who report UFO sightings are often dismissed as crackpots, but there are plenty of anecdotes from trusted members of the community. * A report of ball lightning by a cadet on lollipop patrol in the 1960s. * A Special Constable from Kent and two other officers saw three black disc-shaped objects moving over the sky in formation at Minnis Bay, Birchington-on-Sea, in the 1950s. * A retired PC from the Nottinghamshire Constabulary told of an object that had landed in 1976. * A retired London police sergeant recalled being on duty when a family came in to report having seen a mysterious green globe land in nearby marshes. A search was carried out but nothing was found. When the sergeant contacted RAF Fylingdales they told him to send a motorcycle officer with the report. * A retired Superintendent said he saw nine lights moving in formation over Gillingham, Kent in 1966. * A retired Detective Inspector from Oxfordshire was on patrol during the early hours of the morning when his police car struck an invisible object and ended up pointing the wrong way, at Kidlington in 1978. “This one may sound quite humorous and impossible to believe, but the car’s roof was squashed down 18 inches from whatever it collided with – totally inexplicable,” remarks John. “When we’re asked if we think these really were UFOs, the simple answer is we don’t know and are not prepared to speculate. “The officer told us that he was travelling along the unlit section of the A45, from Coventry towards Birmingham, at 2.25am on August 5, 2012. Weather conditions were described as clear with a moon and intermittent cloud cover. “He said: ‘I noticed a light in the sky which was pulsing rhythmically. It was very bright and had a bluish tinge to it. I thought at first it was a plane, but realised this was not likely to be the case as it was only a single light and I‘d never seen an aircraft in that part of the sky. “A couple of seconds later it shot off at an incredible speed, silently, heading towards Birmingham. Suddenly it shot straight upwards into the sky at a phenomenal speed, far too fast to have been any aircraft. “The officer then made his way to Birmingham Airport where he discussed the matter with air traffic control and the crew of the police helicopter. According to ATC nothing had shown on radar and no flights were plotted for that time frame. 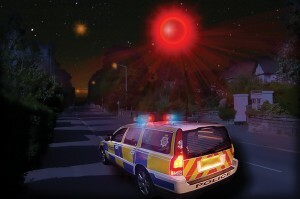 “The officer dismissed any suggestions that he had seen a fireball meteorite, a sky lantern or jet aircraft. He feels that what he saw wasn’t man-made; and maintains an open mind as to the identity of the object. “He also stressed that if it had been an aircraft travelling at that speed, why didn’t it break the sound barrier as it moved through the sky? “Interestingly, a mere few hundred yards away from the lay-by, a crop circle had been discovered the previous day – although our inspection led us to conclude that it was a hoax. “While we were unable to identity what it was the officer saw, we had of course come across many other examples of this phenomenon before during our research. These include occasions when film has been taken of these pulsating flickering objects, which are seen stationary in the sky before suddenly shooting away at speeds which rule out the possibility of any terrestrial explanation. “One such example took place in Greenlands in Redditch a few years ago. The witness, a taxi driver, called the police who attended but were unable to offer any explanation. “Another witness living in Longbridge also filmed a UFO over the Birmingham area in 1995. Haunted Skies: The Encyclopaedia of British UFOs, Volumes 1–7 are available at http://www.amazon.co.uk for £14.99 each.